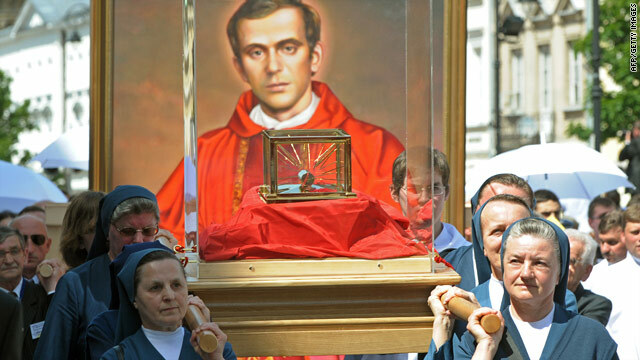 Nuns carry relics of Jerzy Popieluszko in front of his portrait in Warsaw Sunday in a procession after a beatification mass. (CNN) -- A Polish priest killed by the Communist secret police in 1984 was due to be beatified Sunday, a step towards sainthood. The Vatican hailed Jerzy Popieluszko as a "priest and martyr" in announcing his beatification. Three days of celebrations were scheduled around the event in Poland, Polish state radio reported. Some 120 bishops and 2,500 priests were due to celebrate the mass in Warsaw elevating Popieluszko to the status of "Blessed," state radio reported. Popieluszko's mother Marianna celebrated her 100th birthday last week, days before her son was scheduled to be beatified, state radio said, reporting that she was "in good spirits, smiling and with a sense of humor."